The presence of a culinary torch in a kitchen is the sign of a truly accomplished home cook. It’s a must-have for making perfect crème Brulee, but it can also be used for so much more if you think outside the box. 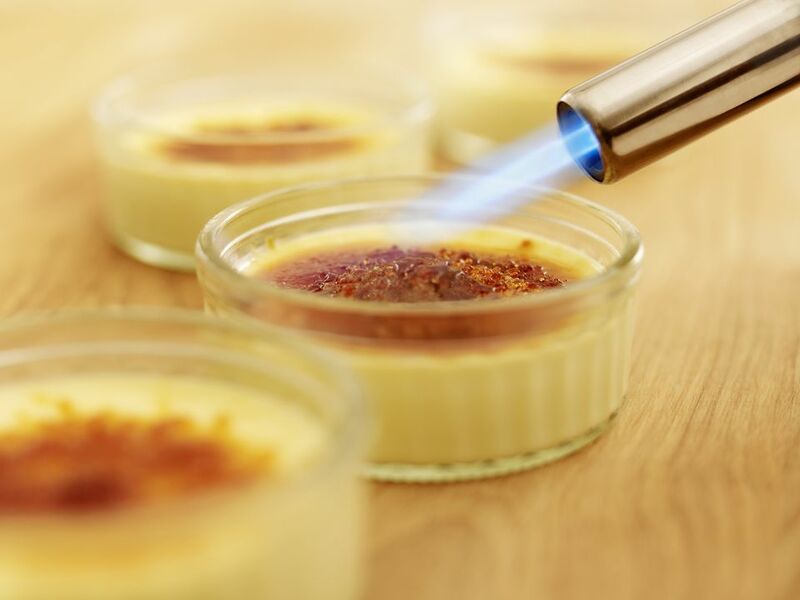 Sprinkle an even layer of sugar on the top of a ramekin of chilled crème brûlée custard. Working back and forth the culinary torch to melt the sugar until it melts and turns pale amber. It will set in a glossy, crisp crust. If you don’t have time to make macaroni and cheese in the oven, you can still fake the crispy, oven-baked crust with a culinary torch. Try this easy recipe: Combine two parts whole milk and two parts elbow macaroni in a saucepan. Bring to a simmer, reduce heat to low and cook until the macaroni is cooked through but still firm to the bite, about 10 to 12 minutes. Turn off heat but leave on the burner and stir in 1 part grated sharp cheddar cheese and 1/2 teaspoon Dijon mustard per cup of cheddar cheese. Add more milk if needed to achieve a creamy consistency and season to taste with salt and cayenne pepper. Spoon into bowls, sprinkle lightly with breadcrumbs, and brown the breadcrumbs with a culinary torch until the cheese bubbles and the breadcrumbs are lightly browned. If you don’t have a toaster oven and don’t want to turn on the broiler of your oven, you can still make a tuna melt or salmon melt. Assemble the melt, then use the culinary torch to melt the cheese on top until it bubbles. Hold it a little further away until the cheese melts, then bring it in closer to make the cheese brown and bubble. Roasting peppers is easier with a culinary torch than in a broiler or on the stovetop because you can direct the flame with more precision. Place a pepper on an aluminum foil-lined sheet pan. Have a large glass or metal mixing bowl and some plastic wrap ready. Beginning with one small area, work the flame of the culinary torch back and forth over the pepper until the skin blackens and blisters. Use a pair of tongs to turn the pepper to reach the other sides, working the torch over the surface of the skin until all of it is blackened. Immediately place the pepper in a bowl and cover the bowl tightly with plastic wrap so that the pepper can steam in its own heat. After 10 to 15 minutes, when the pepper has had a chance to cool, uncover the bowl and remove the pepper. Under running water or using a paper towel, rub off the blackened skin. Cut away the stem and scrape the seeds off the inside. A culinary torch will perfectly caramelize the peaks of the meringue topping on lemon meringue pie or baked Alaska. When you’ve topped your dessert with the meringue, simply work the flame of a culinary torch lightly over the topping until it is lightly browned. For an elegant way to serve grapefruit at breakfast or brunch, cut a grapefruit in half and sprinkle it lightly with brown sugar. Use the culinary torch to broil the surface of the grapefruit, melting and caramelizing the sugar. Get a crisp, beautifully browned crust on a Potato Gratin with a culinary torch. After it is completely cooked in the oven, sprinkle the gratin lightly with finely grated parmesan cheese and perhaps a light drizzle of truffle oil. Work the culinary torch back and forth over the surface of the gratin until the cheese and potatoes begin to crisp and brown. If campfire season is way too far away, use a culinary torch to make some indoor s’mores. Have graham crackers and pieces of milk chocolate bars ready. Spear a marshmallow on a metal skewer and use the culinary torch to brown it evenly, beginning with the torch further away so that it has a chance to heat through without getting burnt, then bringing the flame closer to finish the browning. Immediately transfer the marshmallow to a chocolate-topped piece of graham cracker, using another graham cracker to scrape the marshmallow off the skewer, topping it with the cracker. French onion soup is not complete without a gooey layer of cheese-covered crouton. A culinary torch can melt and crisp the cheese much more easily than trying to navigate a sheet pan of brimming soup bowls into the broiler. Ladle soup into bowls, float a toasted piece of bread on top, and drape a slice of Gruyere cheese over the whole bowl (tradition dictates that the corners of the bread hang over the sides). Use the culinary torch to melt and brown the cheese on top, just before serving.